Trade Minister Tim Groser has revealed his personal view that learning te reo should be compulsory in primary schools. He made the comments on The Nation, when talking about New Zealand's growing relationship with China. The minister said being able to speak and write in Maori would make it easier to learn other languages later in life. Tim Groser concedes his idea is unusual for a National Party minister. “My personal view is that we should be teaching Maori to every 5-year-old child,” he says. “This is turning the usual pakeha argument on its head because what I think should happen is you should introduce very young children from New Zealand to the idea of bi-culturalism and more than one language. Then they will be able to learn other languages as their personal circumstances fit." Research shows that second language learning has positive effects on development. A 1991 American study showed that primary school students of average academic ability improved their reading scores after participating second language classes. A study from the University of Idaho concluded that high school students with two or more years of foreign language study showed significant superiority in performance in English tests when compared with non-foreign language students. It’s accepted as read that learning a second language, whether that language is retained or not, greatly increases a person’s intellectual ability and – obviously - their ability to learn a third language. Selecting Maori as the second language of choice in schools makes sense. Maori is an official language and the indigenous language. It is a creative step and one, as you'd expect, that I welcome. 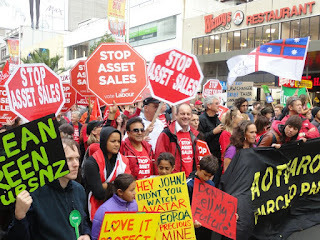 The Maori and Mana parties will support the call, as will the Greens and probably Labour. However, Winston has come out opposed to the idea in principle. On balance, the National Party caucus is probably opposed too. Having said that, I can imagine Cabinet, as opposed to caucus, coming around to the idea. John Key is, I admit, progressive on these matters as are others, for example Groser, Finlayson, Parata and maybe Paula Bennett and Simon Bridges. Others more skeptical than I are calling this an effort to deflect attention from the bigger battles National is facing, think Skycity, land sales, asset sales and so on. I don't think there is anything to suggest this is true. It is, after all, Groser's personal view and a view with the long-term wellbeing of the country in mind. Any suggestion otherwise may be unfair politics. There appear to be more than 3000 people here. The organisers estimated 22,000, the Herald on Sunday estimated 3000, but initial media estimates put the number at 10,000. I tend to agree with the latter estimate. Former Maori Party MP Rahui Katene has indicated she wants to lead the party when the current co-leaders step down. Ms Katene lost her southern Maori seat of Te Tai Tonga at the last election, but plans to stand again in 2014. She says three years in Parliament was not long enough for her vision for Te Tai Tonga to be put into place. The lawyer says she would stand again as an MP for the Maori Party - and be leader - if that is what the people want. She says she is making herself available and she would love to advocate on voters' behalf. Ms Katene says she would seek re-election in Te Tai Tonga because that is where she is from and where her iwi is. First of all, let me declare my conflict of interest here. I’m doing a little bit of work for Rino Tirikatene, the current MP for Te Tai Tonga. Anywho, Rahui will not win in 2014, bar an extraordinary and unforeseen event. 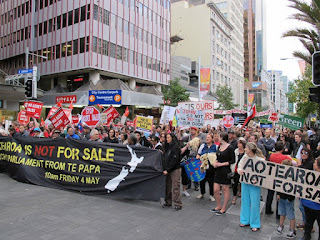 Te Tai Tonga has never been, and probably never will be, a natural electorate for the Maori Party to target. Te Tai Tonga is far different in character from the other six Maori electorates, mainly in that tino rangatiratanga is not the dominant ideology among Maori in the electorate. If Rahui is serious about winning back the seat, basing herself in Wellington is not the best decision. When Rahui won the seat in 2008, she did so off of the back of Wellington. With that in mind, she should be targeting areas in the south where she is weak and where voter support is soft. Christchurch is, arguably, the centre of the electorate and the prize, so naturally it should be her base. Profile is important in any electorate, but that is one area where Rahui failed. She did not build a solid support base before and leading into election year, which meant her hold on Te Tai Tonga was always going to be tenuous. From a strategic point of view, Rahui failed to carry her support in Wellington – her stronghold in 2008 - and did not solidify the young vote (where she did well in 2008). If Rahui wants to win, Tariana Turia should anoint her as the successor in Te Tai Hauauru. However, even then, without tribal links to and knowledge of the electorate Rahui’s chances would be marginal. Tamaki Makaurau is an electorate where tribal links are not as important, so that could be a possibility. However, Rahui has no profile in the electorate. Under the Maori Party constitution, there must be a male and female leader. At the moment, the leader in waiting is Te Ururoa Flavell – who isn’t guaranteed a win so long as Annette Sykes stands again. I think, come 2014, the Maori Party is finished. The narrative that the Maori Party are sell-outs is set and the party has failed to counter it. Tariana Turia and Pita Sharples are, perhaps, the only genuinely pan-Maori leaders in Parliament. Te Ururoa and Rahui don’t have the pan-Maori appeal of the current leaders. Unless the Maori Party defines a base, for example conservative Maori, the party will fail with Te Ururoa and Rahui who are not pan-Maori leaders. By Microwave blog, named after a description of a set experiences I faced as a junior reporter, will endeavour to look at Maori issues as they are portrayed in the media. This is a great concept. There is precious little written on Maori and the media and even less on how the media treats Maori issues. By Microwave is written by Karla Akuhata, a former journalist from the Waikato Times (and a good one too). Take time to check out and keep up with her blog here. So last night I was on Closeup in one of those primitive “race debates” with John Ansell and Hone Harawira. I agreed to go on the show under the impression we were going to talk politics – how naïve is that. With John Ansell in the room, I should’ve realised the discussion was never going to be informative and reasoned, of course that was never the intention. The intention appeared to be to get John Ansell and Hone Harawira together, play them off against each other and then have me pipe up occasionally as the token “moderate” or “young person”. Of the panels I’ve done, last night’s was the most venal. It achieved nothing other than to provide John Ansell with a platform to parrot his flawed and offensive views on Maori and New Zealand society. I was, more than anything, stunned and confused with what was said last night and, I think understandably, angry with Mark Sainsbury’s unwillingness to shift the conversation towards reason, as opposed hyperbole, misrepresentations and lies which is where Sainsbury directed the discussion. I guess it teaches me a lesson – a lesson not to be so naïve and to also prepare accordingly when in the same room as John Ansell or any other like minds. For an excellent discussion on Ansell and last night see this from Scott Hamilton at Reading the Maps. I'm on Closeup tonight at 7pm on TV1. I'll be on with Willie Jackson and John Ansell. It's, at this stage, a follow up discussion on the Popata brothers story that ran last night. Associate Health Minister Tariana Turia said yesterday that the Cabinet had agreed to introduce plain packaging alongside Australia – but only after public consultation. It is the next step in the Government's drive to make New Zealand smokefree by 2025. From July, a ban will come into force on the open display of cigarette and tobacco packs in all shops. So far this term, this is the Maori Party’s signature win. Last term the party secured a select committee inquiry into smoking. The inquiry resulted in, among other things, a tax hike on cigarettes – not insignificant securing a tax rise under a National government. After Whanau Ora, the Maori Party’s efforts for a smokefree New Zealand by 2025 have resulted in the most tangible benefits for Maori. The Maori smoking rate is trending down and the rate among Maori girls, a notorious smoking group, is dropping dramatically. Plain packaging isn’t guaranteed, however, with British American Tobacco saying that they’ll “take every action necessary to protect its intellectual property rights”. Australia, the first country to introduce plain packaging, is currently facing a legal challenge from British American Tobacco. Public consultation will also occur. Should the government guarantee settlements? One of Taranaki's largest private investment projects has gone horribly wrong, losing close to $20 million in a series of high-risk financial ventures. The loss means Taranaki's most northern iwi, Ngati Tama, has shed all of a $14.5m Treaty of Waitangi payout it received in 2003. Shocked iwi members learned of the financial disaster at a hui at Pukearuhe Marae this weekend. Where, one should ask in the wake of this stuff-up, does the government’s obligations end. Treaty settlements are full and final. However, I don’t think - and I’m open to correction on this point - that the Waitangi Tribunal, Crown Law or Cabinet have ever interpreted full and final to mean that the government’s obligations end once settlement legislation is passed. Indeed, if the government knew a tribe’s settlement was close to collapsing, and did nothing, then the government would be liable for a contemporary breach of the Treaty under the partnership and active protection principles. So, despite the full and final aspect of settlements, the government retains on-going obligations under the principles of the Treaty. The full and final notion relates to, I believe, the redress component. It does not nullify other obligations the government has towards Maori. With this in mind, does the government owe Ngati Tama compensation? Personally, I don’t think so, but I know other Maori think compensation is appropriate. From what information is in the public domain, the government had no idea of the situation and no hand in it. Ngati Tama’s loss came as a result of poor management. However, if the government can guarantee risky finance companies and, when they go bust, pay out sums well in excess of all treaty settlements combined, why can’t the government guarantee treaty settlements? A valid question and one I can’t find a compelling answer against. It is negligent, on the government’s part, to absolve itself of responsibilities once treaty settlements are passed. After all, the government is in a sense making an investment. Therefore, the government should ensure appropriate mechanisms are in place to manage the settlement. Before a settlement can be transferred, a tribal organisation must be in place, but it is not a requirement that an adequate corporate arm is in place. This is inadequate. 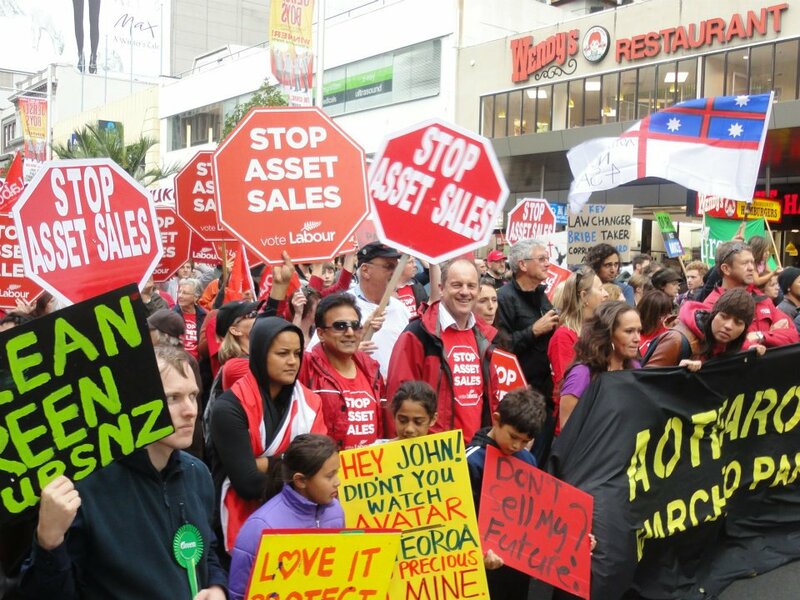 Once settlement legislation is passed, it is on iwi to make what they will of the settlement. However, many of the smaller iwi, have no experience, expertise or knowledge in and of commercial matters. The larger iwi tend to do okay, for example Ngai Tahu and Ngati Awa, but the smaller iwi often do not have expert tribe members to draw on. This isn’t universally true, I should add, Tainui came close to bankruptcy a few years ago. I agree with Richard Jones who says that “an extra layer of due diligence is necessary when planned investments are outside the traditional areas such as the primary sector and property”. Maori tend to do very well in primary industries and property, yet no so well in the sort of investments Ngati Tama made. In fact, I think it is almost unprecedented for an iwi to invest heavily in an overseas company, and a software company too. Ultimately, Ngati Tama had too much exposure to what were a handful of very, very risky investments. I can understand the desire to make something of a miserly settlement, but I don’t think Ngati Tama’s leaders kept in mind that management of treaty settlements should be conservative. The settlements are meant to be sustainable and intergenerational; it’s not for current generations to milk it for all it’s worth with risky investments. Having said that, I shouldn’t speculate on what was motivating Ngati Tama leaders and what, I suppose, really happened. I think the CEO of Ngati Tama, Greg White, and the Board owe the people of Ngati Tama an apology. Hekia Parata isn’t one to back down, it goes against her instincts. She’d be smart, however, to take a step back and reverse the decision to close Moerewa School. The Ministry and the Minister’s Office are losing the PR battle and Hekia’s mana is diminishing. Parata refused to front Native Affairs on Monday, however she gladly took a less stringent interview on Te Karere that day. Other than that interview, Parata has attempted to keep her hands clean, but she’s taken a battering in the media rather than appearing above the fray. The previous Education Minister, Anne Tolley, ordered the school to close its senior unit. As a brief aside, the government is, I’m told, merging and closing rural schools as a cost saving measure. For example, in the Eastern Bay of Plenty (pop 50,000) two primary schools have closed, a merger between an intermediate and high school is scheduled and one primary school has become a year 1-13 kura. An anecdote, yes, but instructive nonetheless. Anywho, the Ministry is citing alarmingly low pass rates as a justification for closing the senior unit. However, given there are less than 20 students spread across three different achievement levels, even one person failing will bring down the percentage significantly. Before audit, the pass rates were 93%, 83%, 100% and 100% at level 1, 2, 3 and university entrance (UE) respectively.This is well above the national average for Maori. After audit, however, the pass rates were 11%, 33%, 33% and 100% at level 1, 2, 3 and UE respectively. Strangely, NZQA awarded the students UE, the requisite standard to enter university, but did not award level 3 meaning those students cannot go to university. This is a perverse situation. Of those students that failed, they only failed by a small number of credits. Usually, if a student fails an internal assessment, they’re given a chance to redo the standard. However, in this case, the students that have failed will not get that chance, a chance that all other NCEA students get. The most appropriate course of action would be for the Ministry to work with the school to improve marking and moderation and then give the students a chance to gain the small number of credits they need. At level 1 all of the students gained the requisite 80 credits overall to pass, but failed to gain the required numeracy (maths) credits. This is common across all schools and is usually rectified internally, but again those students aren't getting the chance.Instead, the students are been thrown to the dogs as a result of the Ministry’s excuse, and it’s an excuse, to shut the school. On Monday the Moerewa senior unit will open its doors for term 2. This move has the support of the local community, the local board, the school staff and the students. Many in the community believe Tolley’s, and now Parata’s, directive is punishment for the schools vocal opposition against National Standards. In a letter instructing the school to close its senior unit, Tolley noted the school’s refusal to implement National Standards. When a small problem like the above arises in a school the Ministry, or in this case NZQA, would usually work alongside the school to smooth over the problem. However, this hasn’t happened. In fact, the low pass rates excuse was only dreamed up under Parata only two weeks ago. Last year the Ministry weren’t even citing a coherent excuse to shut the school. Now neither the Ministry, NZQA or the Minister's Office will enter dialogue with Moerewa School and the community. This decision smacks of a politics, not policy. 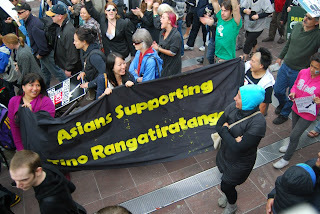 Parata should do what’s right, and retain what’s left of her mana in the eyes of Maori, and keep the school open. 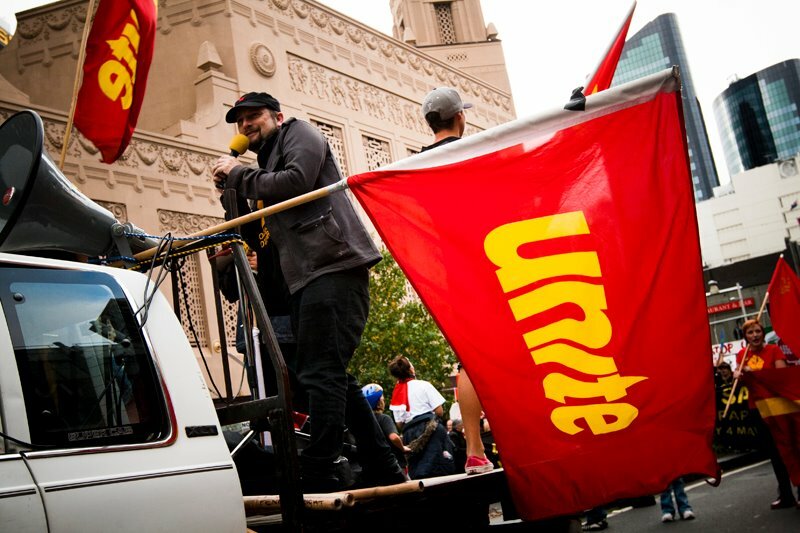 Prominent protesters are accusing the Police of brutality. The protesters, which include John Minto and Joe Carolan, were protesting the eviction of state house tenants in Glen Innes. Apparently Minto was beaten and female protesters were handled violently with one woman entering a seizure as a result of the Police's heavy hands. 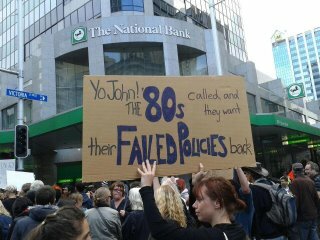 Of course, this is exactly what the Police do with protest, especially the blue nappied babies they recruit for South Auckland. They're desperate for recruits so they, more often than not, recruit brain-dead males fresh from failing to gain university entrance or any meaningful academic qualification. I've always said, you become a cop if you're too dumb to do law and too soft to join the military. For more see this from TW.com and Socialist Aotearoa. 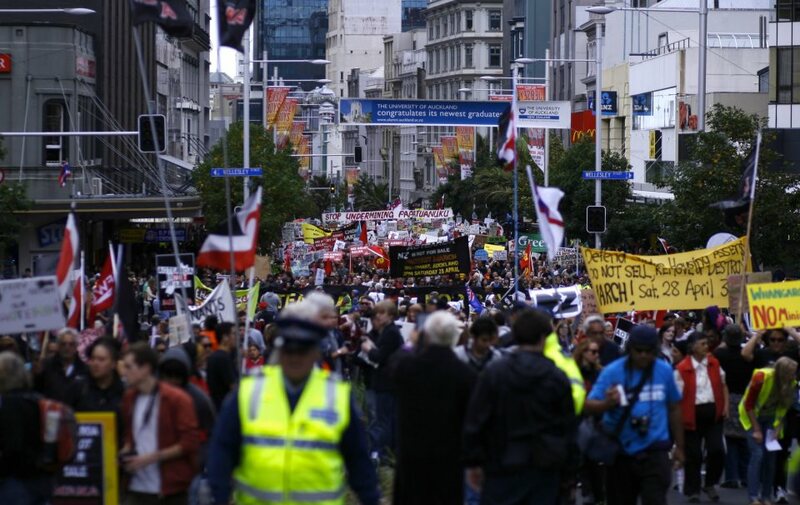 UPDATE: Hone Harawira will be helping lead the protest tonight. I'll be on Native Affairs tonight with Sandra Lee probably. The show starts at 8.30pm on Maori TV. Some members of the Te Arawa tribe are looking at the possibility of creating a "tribal parliament", says the chairperson of the Rotorua-based Te Arawa Lakes Trust, Toby Curtis. Initially floated a few years ago, the concept gained momentum at the trust's annual meeting in March, and Mr Curtis says an organisation has been set up to investigate the details of setting up a single tribal body. Tainui iwi would be willing to help the Te Arawa iwi set up a tribal parliament in the Bay of Plenty, says spokesperson, Rahui Papa. (Mr Curtis) says the Kauhanganui or the Waikato-Tainui Parliament model appeals to him, because both tribes have similarities. That’s a worry. Te Kauhanganui (TK) has proved ineffective as a governing body. Te Arataura, the executive committee, has acted (often against the wishes of the majority of the tribe) without restraint from TK. It would be stupid to model a Te Arawa parliament on TK. The complexity of many iwi structures breeds internal instability. Often there is no clear hierarchy, powers and responsibilities overlap and tribal members are excluded from the day to day running of the tribe’s assets and, quite often, denied the benefits of those assets. I cautiously, very cautiously, support the idea of tribal parliaments. However, the autonomy of the hapu must be retained. Under the Tainui model Marae and hapu are largely irrelevant in the face of the Tainui superstructure. Te Kauhanganui, Te Arataura, Tainui Group Holdings, the Kingitanga and so on overshadow and diminish the role of the Marae and hapu. Power is centralised and then dispersed among subsidiaries, for example Tainui Group Holdings. One element of the problem is that specialist legislation is not in place to create suitable iwi structures. Many iwi structures work within the framework of, for example, the Incorporated Societies Act, rather than an act relevant to Maori needs. This is one area where the Maori and Mana parties are very quiet. Labour has made some noises around evaluating post-settlement iwi structures, but has not released any detail. Racism, bigotry, redneckery: it’s all on display in Devonport, an upmarket suburb on Auckland’s North Shore. The local residents have their hackles up over a treaty deal that will include a 3.2ha block at Narrow Neck. The block is currently used by the Navy. 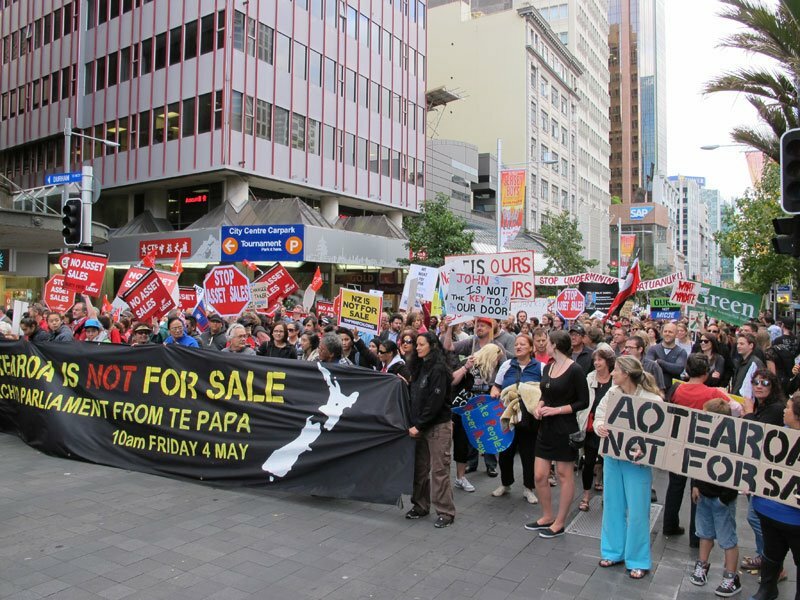 Under the settlement, Ngati Whatua will be given the opportunity to purchase the block. Once the land passes into Ngati Whatua's hands, local residents fear the tribe will develop the land. This is unfounded. The Navy will continue to lease the land for the next 15 years at least. With this in mind, the character of the area will not change in the medium term. Put simply, the status quo will remain. Even if Ngati Whatua refuses to extend the Navy’s lease, district plan rules prevent intensive development. Under the recreation rules in the North Shore District Plan, this plan is still operative in the absence of the Auckland Unitary plan by the way, any development on or adjacent to reserve land is restricted in height, must be compatible with “the character of the reserve”, the “qualities” of the area must be maintained and so on and so on. Effectively, planning rules prevent development that will detract from the purpose and character of the reserve. The resident’s fears of commercial development are unfounded. Under the Hauraki Gulf Marine Park Act (HGMP) the block was to be included in the adjoining reserve when the Navy vacated. However, the Act also stipulates that this is not operative if the land is or becomes subject to a treaty claim. 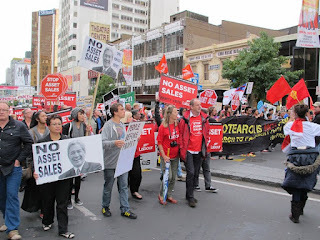 Therefore, there is nothing illegal about selling the land to Ngati Whatua. As it happens, the Herald reveals that the land was subject to a treaty claim interest when the HGMP passed. Discussions over including the land in future treaty settlements begun in 1995 and were referred to in a 1999 court case that led to the creation of the HGMP. The Waitangi Tribunal also flagged the land in their Tamaki Makaurau report and the Herald referred to the possible sale as early as 2006. So, to be fair, the residents can’t argue that the sale of the block has come out of the blue - the land was earmarked for treaty settlement purposes before the HGMP was even formulated. Access to the adjoining reserve will not and cannot be restricted. Nagti Whatua have publicly assured the residents that access will not be restricted, even though Ngati Whatua can’t restrict access to the reserve. The block is currently closed to the public and does not, even though it is closed, prevent access to the adjoining reserve. The block is only 3.2ha adjoining not blocking, key words not blocking, access to the 11.9ha reserve – access to the 11.9ha remains unaffected by the deal. The Treaty Negotiations Minister, the excellent Chris Finlayson, has no obligation to consult the residents of Devonport, contrary to their belief. This is a matter between Maori and the Crown – not Maori and the community. Even if there was an obligation, former North Shore MP Wayne Mapp fulfilled that obligation when he briefed the local board last year. However, according to Dr Mapp, the local board failed to, excuse the awful pun, take it on board. Finally, the government and iwi have secured approval from the Hauraki Gulf Forum. It was the Gulf Forum that secured the areas marine park designation so surely they are the most appropriate group to consult and seek approval from. Residents, the local board and the Auckland Council are lodging submissions to the Maori Affairs Select Committee. 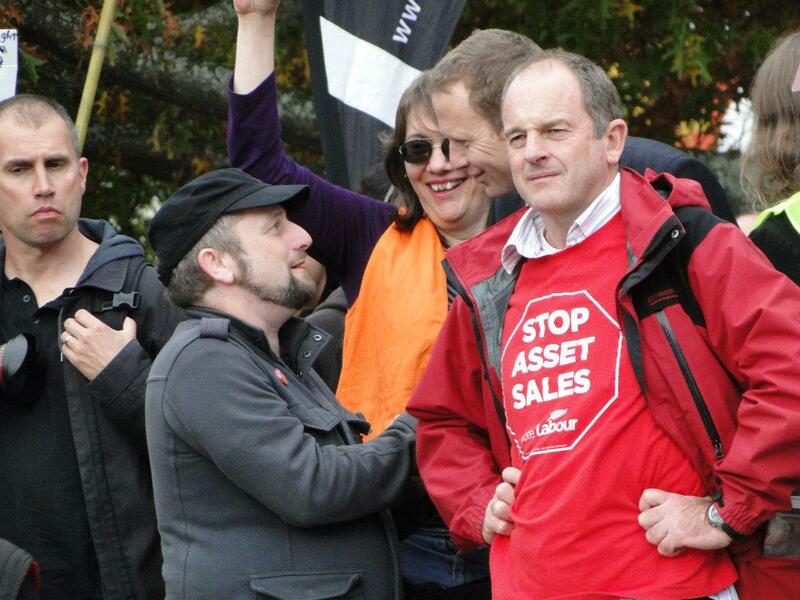 It's shame to see the Auckland Council, most notably Len Brown, buy into the hysteria and misinformation. Only last year the Mayor delivered a "warm" speech and waiata at the signing of the deed of settlement. There are a host of misconceptions surrounding the settlement – most driven by the bigoted residents and the filthy local rag. What underlies objections to land transfers, or in this case land purchases, is racism. Many New Zealanders have an unfounded fear that Maori will restrict access, develop the land in ways that will negatively affect the community and so on. I’d challenge anyone who operates under this mind set to point to more than one example where Maori have blocked access to previously public land, urupa (cemeteries) and other waahi tapu (sacred) sites excluded. Restricting access runs contrary to Maori values. After all, there is no such thing as private property in Te Ao Maori. The racist residents should keep in mind how Maori suffered significant losses. As one example, shortly after the Treaty was signed the Crown bought 3000 acres of what is now downtown Auckland for 281 pounds. Within six months, it had on-sold 90 acres of that land for 24,500 pounds. (For a level head see this report from Native Affair's Semiramus Holland). I’m back to semi-regular blogging this week. I’ve had a few things on my plate that have pushed blogging back. Anyway, here are my thoughts on a few things I’ve missed. Ths Sunday Star Times (SST) has crowned Kawerau the beneficiary capital of New Zealand. Of the 6940 residents, 1324 are on a benefit. In other words, an unhealthy 19% of the town receive a benefit. In 2010 Simon Collins christened Kawerau the DPB capital of New Zealand. Unfortunately, the SST quoted Mayor Malcolm Campbell. Any decent Mayor would acknowledge the problems the town faces and formulate solutions, but not Mayor Malcolm Campbell. Instead, Campbell offered an excuse and then a falsehood. Firstly, he claimed that beneficiaries are “staying put” which seems to imply he thinks that numbers are artificially high. The problem has nothing to do with the inflow and outflow of beneficiaries, the problem is intergenerational unemployment and, who would think, a lack of jobs. The Mayor continued claiming that there is “huge employment here”. This is, at best, a half-truth. The main employer is the Kawerau Mill, and the Mayor is right in saying most mill employees live outside of Kawerau. However, the number of jobs at the mill continues to fall (a trend that begun in the 80’s) and the jobs that do exist are skilled. There are few job openings as most mill workers tend to stay put, sometimes for decades. Put simply, there aren’t any jobs due. The forestry industry, probably the second largest employer in the town, is in decline as well. The Mayor’s solution is to create an “exclusion zone”. In other words, the Mayor would like MSD to prevent beneficiaries from moving to Kawerau. I oppose this idea in principle. However, brushing aside principle, for public policy reasons it’s a sensible idea. I understand that the Mayor probably doesn’t want to increase the rate of ghettoisation of the town. Nevertheless, rather than invent ways to keep beneficiaries out, the Mayor should focus on inventing ways to get beneficiaries into jobs. Tuhoe is Te Urewera, Te Urewera is Tuhoe: Tamiti Kruger, the tribes lead negotiator, is confident Tuhoe and the Crown can finalise a settlement package that includes the ownership, or worst case scenario management, over the Ureweras. 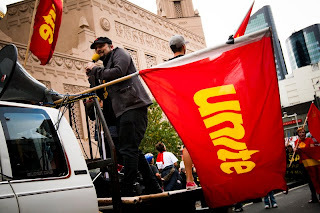 Inclusion of the Ureweras is the only acceptable outcome for the tribe. The point I want to make, however, is that the Urewera issue is, for want of a better term, a secondary one. Some form of self-governance, kawangatanga if you will, is the issue with the most significant consequences. I’m in favour of transferring local government functions and powers to the iwi. Think the Urewera District Council. The Council would come under the Local Government Act. The iwi could also run their own charter schools. Over time more functions and power could be devolved. The chances of the Crown creating an Urewera District Council, or a similar body, are moderate. Political push back from the National Party’s supporters would, I imagine, be significant (“first step on the slippery slope to separatism blah blah blah”). However, it makes sense to separate the Urewera region from the Whakatane District Council (WDC). The Urewera region is a separate and disparate community of interest. Whakatane and the Urewera region share very little in common – not even tribal links (Whakatane is Ngati Awa and the Ureweras is Tuhoe). Whakatane and Ohope, the major centres in the district, are largely Pakeha and urban. The Ureweras are largely Maori and rural. Whakatane and Ohope are concentrated whereas the Urewera region is dispersed. Given this difference in character, most notably the fact that Whakatane is Pakeha and the Ureweras is Maori, the Council ignores the Urewera region. For example, roads and sewerage systems are not adequately maintained, there is no rubbish collection and library services and other social services are non-existent. The case for creating a Council is, I think, strong. After all, the Urewera region is wholly disconnected in terms of location, character and need to the Whakatane region. For those of you that know the area, you only need to compare Ohope and Taneatua to get the picture. The consequences for Maori will, I think, be minor. Tuhoe is in a unique position. There is a precedent for self-governing arrangements and, arguably, Tuhoe have enjoyed unbroken rangatiratanga over their lands. Self-governance arrangements could not be extended to, for example, Nga Puhi without significant push-back from non-Maori New Zealanders. 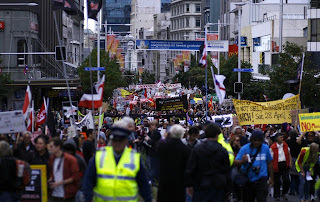 New Zealanders really do fear “separatism” and many naively want for us all to be “one people”. Tuhoe and the Crown have given themselves until the end of the year to flesh out an agreement. The Herald has caught up with the relativity clause story with Yvonne Tahana running two pieces. In a sense, the relativity clause plays against New Zealander’s sense of fairness, our famed egalitarianism in other words. The relativity clause looks like double dipping, no doubt about that, but it’s merely a mechanism to ensure Tainui and Ngai Tahu maintain their position relative to other iwi. The two tribes took a gamble when they settled early and the relativity clause was a means of inducing early settlement and ensuring that, should future settlements prove more fruitful, that Tainui and Ngai Tahu are kept on equal footing. Of the parties in Parliament, Act and New Zealand First are the only parties in a position to make hay out of the issue. National cannot attack the deal, after all the clause will be triggered under their watch and it was the previous National government that negotiated the clause. For credibility’s sake, their hands are tied. Some in Labour will be tempted to attack the clause, but the party’s Maori caucus wouldn’t stand for it. The Greens know better and would not want to be seen to be opposed to treaty settlements. Tuku Morgan has decided against seeking re-election to Te Arataura. Although Tuku secured a co-management deal over the Waikato river and presided over Tainui's rise to the position of 'richest' iwi, he also presided over a period of internal instability, profligacy and a decrease in the distribution of benefits to tribal members. Tom Roa, former chair of Te Kauhanganui, and Hemi Rau, who Tuku fired in 2010, are the chair and deputy chair respectively. Both, I believe, bring valuable experience in tribal politics and management. Joshua Hitchcock has floated the idea of an independent Maori Policy Unit. A sort of Maori law commission. I’m in favour and would love to contribute. Over the next week I’ll be giving the idea some thought, you can do so too. Here’s the link to Joshua’s post on the topic where he invites public discussion.